In a post-Labor Day DCCC Analytics survey of likely 2018 general election voters, Democrat Cindy Axne leads Republican David Young by 3 points (46% to 43%, with 11% undecided). Axne has a strong advantage among women (51% Axne, 38% Young, 11% undecided), leads among registered independents (39% Axne, 35% Young, 26% undecided) and wins a significant share of registered Republicans (22% Axne, 72% Young, 5% undecided)—all patterns in line with previous Democratic victories in this district. 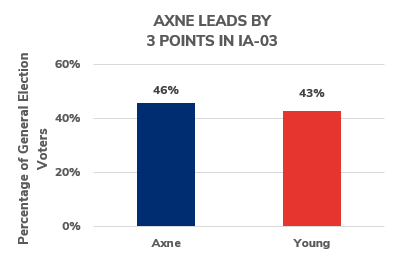 The generic Democrat leads by an even wider margin (45% Democratic candidate, 35% Republican candidate, 20% would leave the ballot blank or support someone else), indicating Axne has potential to grow as voters learn more about Congressman Young’s record in Washington. These results mirror the ALG Research poll released by the Axne campaign in mid-July that showed a nearly identical Axne lead (Axne +4) and generic ballot advantage (+9 Democratic candidate) within the margin of error of this survey. Voters are not buying the onslaught of false, negative advertising from Republicans and continue to support Axne. These results are based on a DCCC survey of 575 likely November 2018 general election voters in IA-03, conducted September 4–5, 2018. Respondents’ information came from the voter file and this poll was conducted through a standard blend of live cell phone and automated calls. The margin of error is +/- 4.1%.